During the early part of the first and second centuries the Romans developed an infrastructure at the port of Hastings. This statement is supported by the Department of Transport Field Survey finding Roman pottery on the site. Also supporting this is the visual evidence, which can be demonstrated to exist by adopting the methods of the pre-eminent Roman road researcher I.D.Margary, who wrote the definitive study (123) on the matter. 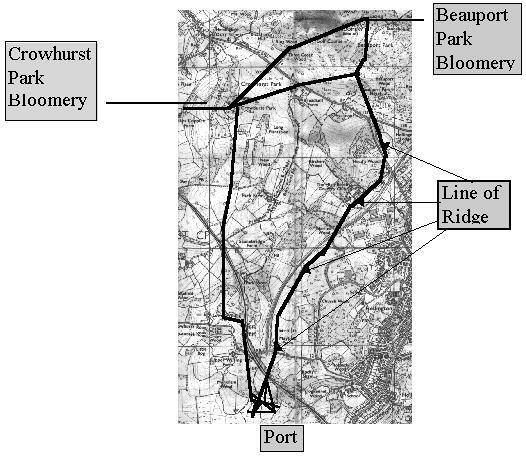 This led me to embark on the mammoth task of tracing a huge number of tracks leading from the port site at Redgeland, including two that led directly to the two largest Bloomeries(124)in the area, at Beauport Park and Crowhurst Park. The tracks in question can be identified by the visual recognition techniques employed by Margary and are most evident in hedgerows and along footpaths that are no longer in existence. Within the port site these are further substantiated by the resistivity data, which we shall examine later. 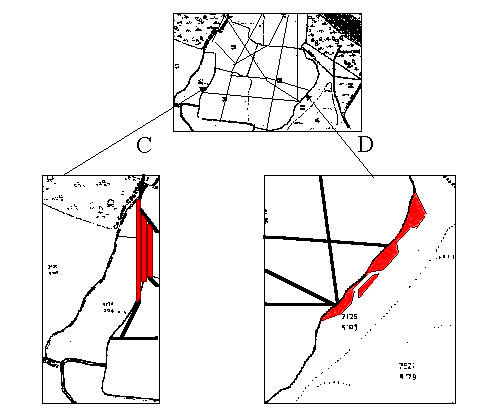 The most striking evidence of Roman occupation is the earthen jetties adjacent to deep water berths (125) on the East and West of the port site (marked C and D on the Plan below). These amount to large earthen structures in the region of 100 meters in length running along the shore, designed to provide access for loading ore.
Site C has three different levels of terrace, one running almost the complete length of the inlet. Site D on the other hand appears to contain an island jetty which allows vessels to birth and turn with the minimum effort. These sites are currently completely overgrown with vegetation, needing clearance and detailed examination. Each of these jetties, as I have called them, is connected to the other by a series of tracks, forming a veritable network of inter-connections. These lead from each berth to the other, and from there via a number of routes to the local Bloomeries. This map shows the route taken from Beauport Park and Crowhurst Park to the deep water berths at Bulverhythe. 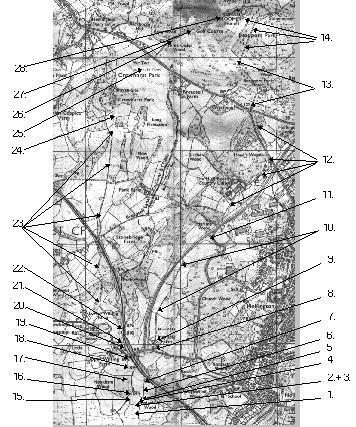 As well as visual evidence provided using the Margary method further evidence can be provided by study of the 1844 tithe map of Hollington. 17. Track follows right hand side of stream crossing 10 yds north of fork with agger type mound running out through undergrowth. 22. Roman track carries on to top of mound then forks left to join footpath at bottom of valley, detouring steep ravine. 23	Track follows field boundary to Crowhurst Park. 28. Enters excavation at west end of site.